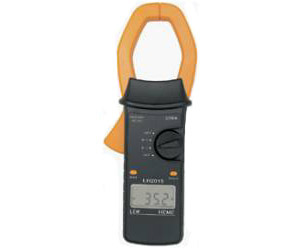 The large jaw of the LH2015 is suitable for current measurements up to 2000 A ac/dc on large conductors or bus bars. The measurement accuracy of the LH2015 is unaffected by external magnetic fields or off-center conductor positioning due to its advanced jaw design. Its Display-Hold feature freezes the measurement for viewing after measuring and the MAX-Hold captures the maximum measured current.